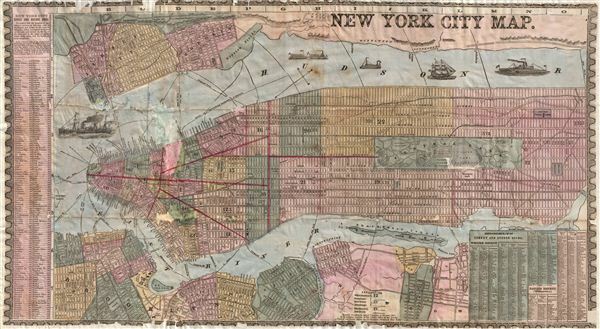 An uncommon and colorful 1857 map of New York City by Humphrey Phelps. The map covers Manhattan south of 131st street as well as adjacent parts of Brooklyn, Queens, Hoboken, and Jersey City. Individual streets are named as are many individual buildings. The map notes various fery crossing, names piers, and shows shipping lanes. Various types of sailing, cargo, and stem vessels decorate the Hudson River. Where Columbia University now stands, this map reveals a 19th century Lunatic Asylum. Central Park, though only in the planning stages when this map was published, is rendered detail exhibiting the fully glory of Olmstead's plan. The mid-19th century was a dynamic period in urban development of New York City. Under the governance of Tammany Hall and the corrupt 'Boss' Tweed, New York City had become a melange of extremes. By 1864 the Five Points had devolved into the world's most notoriously dangers slum, while further north the high ideals and design genius of Frederick Law Olmstead and Calvert Vaux created Central Park, the world's first and possibly finest planned public recreation area. Meanwhile, across the east River, Brooklyn, Greenpoint, and Williamsburg consolidated into a single city, becoming in the process the third largest city in the United States, and setting the stage for the emergence of the modern New York City. Prepared for issue in Humphrey Phelps' Strangers and Citizens' Guide to New York City. This map has condition issues, please note the condition statement below. Timothy and Edward Ensign, B.W. Thayer, Bridgman, Phelps & Fanning were important New York map publishers operating in the mid part of the 19th century (roughly 1841 - 1861). Working both independently and in partnership they issued numerous interesting views, plans, guides and maps of the United States, New York State and New York City in a variety of formats. Humphrey Phelps, in concert with other publishers, produced various maps in conjunction with the "Phelps' Guide", roughly 1840 to 1850. With to regard the lives of Thayer, Bridgeman and Fanning, little is known. Phelps, H., Strangers and Citizens' Guide to New York City, (New York) 1857. Average. This map has been professionally restored with added margins on all sides. There are significant fill repairs in lower manhattan - see image. Price adjusted accordingly. Haskell, D., Manhattan Maps: A Co-operative List, 1045.